My most frequently asked question: Are you a nurse? No. Nursing is something that I don’t have the stomach for, nor the emotional strength to do. I would get to personally involved with each and every patient and their family, because that is how I am. A dear friend, Sarah, is a nurse, and I commend her and all other nurses for their hard work and dedication they put in each day caring for other people. When Sarah became a nurse, I made my 1st nurse doll, named it after her, and gave it to her as a gift. People saw it and wanted to buy it, that is how my nurse doll collection got started, and has been growing ever since. What does OOAK mean? “One Of A Kind.” Some of our vintage aprons and other items were made from old linens or lace found in antique shops. At times, there is only enough supplies to make one special item, therefore it is a OOAK, meaning we only made one of that particular item. Do you sell wholesale? Absolutely not, due to the nature of each craft or item being made one at time, the amount of time, dedication, materials, and creativity each item takes to make, we do not, and will not sell items at wholesale prices. What are forms of payment do you accept? 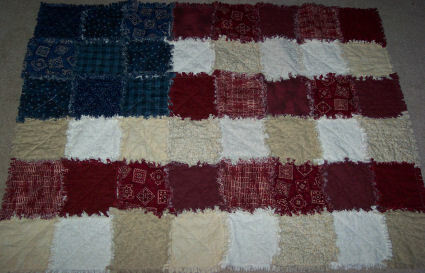 We accept visa/MC by phone, paypal, and personal check or M.O..
“God Bless America” let your colors show with our handmade raggedy flag quilt. It’s large enough to display as a wall hanging or on the back of a sofa. © Copyright StitchesInFaith.com 2008 • All rights reserved.